Right Renovations is a reputable local company - built through excellent recommendations and a high quality finished product. With a qualified carpentry skillset, all works from bespoke joinery to experienced building work is undertaken. We pride ourselves on fantastic customer service and a beautiful finish to go with it - so much so that we guarantee works carried out by ourselves for 10 years. From kitchens & bathroom refurbishments to hand crafted wardrobes and units. Loft conversions & extensions to hand built staircases and space saving bedroom ideas. No job is too big or small for our enthusiastic team. Please see the website for more information and examples of our work. Jamie and Brad were great, transforming our kitchen and bathroom on budget and on schedule. They were considerate, friendly, professional and efficient, and the work is all done to a very high standard. We have now lived with the new rooms for 6 months, and they still look great. We’ve had some poor experiences in the past with other firms, but would definitely use this company again and recommend them to anyone most highly. Jamie provided a very competitive quote for converting our garage into a room. Jamie and his subcontractors worked diligently with minimal disruption to the rest of the house. His work was completed to a high standard and before our deadline. We're very happy with what he and his team created. Jamie and his team were great from start to finish. 5 months from foundations being dug to finishing the extension and total refurb of our 5 bedroom house. Skylight, vaulted ceilings and excellent advice on design and works were of a high standard throughout. The team tidied each and every night making it easier for us and our 4 young children to stay in the house during the build. We would not hesitate to recommend Jamie and Right Renovations again and again! Jamie carried out a build in our kitchen to remove an existing built in small cupboard and replace with one that is much larger and more accessible. The work was carried out in just over 2 days which included painting the new unit. Jamie and Joe worked effectively and efficiently and took time to explain what they were doing and why the original plan had to be modified. They also took time to clear all the debris and hoover the kitchen and approach areas. Would use again and I would highly recommend. Jamie and his team installed an "in-frame" kitchen for us. They turned up when they said they would, left everything clean and tidy every night and did a fabulous job. There were some unexpected problems with the electrical aspects and Jamie made sure that these were sorted out properly and all within the original budget. Jamie has also done a few other jobs for us, including a fairly big drive project, and the work has always been excellent. I would not hestitate to recommend Jamie and his team. Jamie and the team carried out a side and loft extension for us. They were a pleasure to work with. We didn't live on site but they kept us up to date. When there were any unexpected problems, things were quickly resolved and nothing was a problem. Jamie was also proactive and came up with a tweak to our plans to give us more space. Would recommend Jamie and his team. 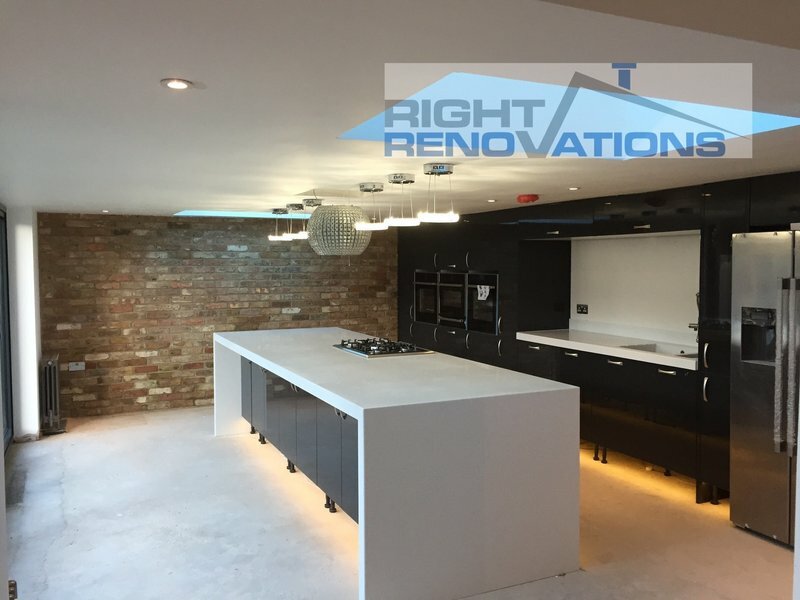 Right Renovations have completed two large house renovations for us over two phases and we have found them to be very professional and good to work with. They were accommodating when we changed our minds and came up with good solutions to any issues uncovered. I would highly recommend this company as they really care about finishing the work to a high standard and ensuring the customer is 100% happy. We were also very impressed when over a year later it only took a text and they come back to make an adjustment to our work. I great company you can trust for all home renovations. Jamie and his team converted our garage into a playroom and downstairs shower room. We could not be happier with the end result and would recommend to all. Jamie was always available to discuss the job and any issues that arose, he would give good ideas and offer solutions to any problems we encountered. Overall the team were trustworthy, friendly and hard working and we would definitely use them again.